Who had advance notice of the 9/11 attacks? Who benefited from the 1929 Wall Street crash? Who was responsible for the AIDS epidemic? If you believe some conspiracy theorists, a single party can be blamed for all of these tragedies: the Jews. Conspiracy theories have been developed throughout history by individuals, religious communities, and political entities to explain negative events, find scapegoats, or fulfill paranoid fears and fantasies. According to conspiracy theories, the world is divided into two camps: the manipulators and the manipulated, those who know (a secret minority) and those who do not (the vast majority). Conspiracy theories have a reassuring way of explaining world events in a simplistic fashion; they serve as a comfortable shortcut to justify the complexities of society. For many people who have suffered from recurrent crises–financial losses, lethal diseases, natural disasters–it is difficult not to understand the origins of such evil. The most terrifying explanation is preferable to uncertainty and mystery. Conspiracy theories are dangerous because their simplicity resists all forms of dismantlement. Worse, those who dare question the seriousness of such theories are accused of being agents in the service of plotters. Conspiracists take on the heroic duty of infiltrating the “enemy” in order to interpret esoteric clues, unmask plotters, and denounce schemes. Accusing Jews of being master conspirators is not new. Since early Christianity, Jews have been associated with plots to control the world and instate a Jewish tyranny. In the Middle Ages, whenever a Christian child disappeared or was found dead, Jews were held responsible. They were accused of using the blood of these children for their Passover matzah. 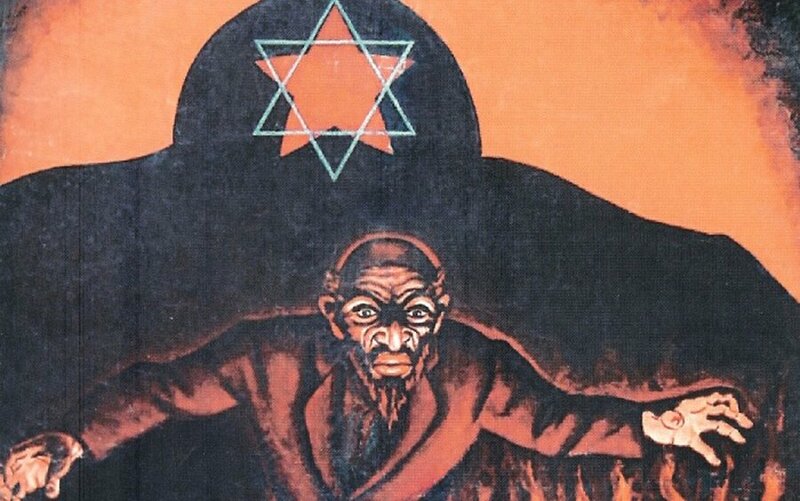 Anti-Semitic conspiracy theories took a modern turn in the 19th century, with the publication of German author Hermann Goedsche’s 1868 novel Biarritz, which describes the Devil appearing before a mysterious rabbinical cabal to plan a “Jewish conspiracy.” In the chapter called “In the Jewish Cemetery of Prague,” Goedsche describes a midnight meeting of the “representatives of the twelve tribes of Israel” to discuss the takeover of the world. Biarritz was a commercial success and probably inspired the author of the Protocols of the Elders of Zion a few years later. The Protocols is, of course, the famous anti-Semitic pamphlet published in Russia at the end of the 19th century. It purports to be the minutes of meetings held secretly by Jewish wise men plotting to control the world. Exposed many times as a forgery, the Protocols has nevertheless continued to be translated, published, and distributed across the globe. In 2003, Egyptian television aired a kind of soap opera based on the Protocols called Knight Without a Horse, a series depicting secret meetings of Jewish elders and Jews murdering Christian children to get their blood for Passover. New spins on the blood libel are alive today in other parts of the Middle East as well. In March 1997, Nabil Ramlawi, the PLO representative to the United Nations in Geneva accused Israel of a sinister plot to kill Palestinian children. “The Israeli authorities infected by injection 300 Palestinian children with the HIV virus during the years of the intifada.” Israelis have been similarly accused of spreading mad cow disease to Palestinians through British-made milk chocolates, killing Arab children to get their organs, and sending AIDS-infected Israeli prostitutes to contaminate the West Bank. In December 2004, Iran’s Sahar 1 TV aired a weekly series called Zahra’s Blue Eyes or For You Palestine. The show featured fictional Israeli doctors taking hearts from healthy Palestinian children for transplants, as well as graphic scenes of Palestinian children whose eyes have been surgically removed and stolen by Israel. But Hizbullah’s Al-Manar TV, Iran’s National News Agency, and the Egyptian daily Al-Ahram are not the sole provider of anti-Semitic conspiracy theories. Amazingly, America has been a fertile ground for such claims, as well. In 1991, televangelist Pat Robertson published The New World Order, which was influenced by a number of conspiracy theories, including the anti-Semitic books of Nesta Webster (1876-1960). Robertson traces the genealogy of a world conspiracy back to a small Freemason lodge founded in 1776 in Bavaria by the German Adam Weishaupt and called the Illuminati. The Zionist octopus must be eliminated. Leaders of the ‘Jewish Lobby’ must be investigated and their various organizations dismantled or registered as foreign agents. The terror attacks of Sept. 11, 2001 generated scores of conspiracy theories, which claim that Israeli agents carried out the attacks, thus confirming the Jewish master plan to rule the world. Other conspiracists argued that 4,000 Israelis who allegedly worked at the World Trade Center stayed home on Sept. 11, because the Mossad warned them about the destruction of the Twin Towers. An Egyptian academic, Dr. Gamal Ali Zahran, head of the political science department at Suez Canal University, wrote shortly after 9/11 in the daily Al-Ahram that Jews who were stockholders in the airlines and insurance companies sold their stocks about 10 days before the attacks and then bought them again at the lowest price, thus making huge profits. Finally, the fact that a Jewish businessman owned the World Trade Center supposedly added to the veracity of the plot, since he obtained millions of dollars in insurance money after the destruction. Here the anti-Semitic canard of the Jewish conspiracy meets the anti-Semitic stereotype of the greedy Jew. Conspiracists in general are reinforced by popular culture, which commonly uses the theme of secret plots, codes, and plans. Books such as Dan Brown’s Angels & Demons, films such as Independence Day, and video games like Lara Croft Tomb Raider build upon traditional conspiracy theories when they add underground networks, secret revolutionary plans, and other esoteric societies. Conspiracists show no sign of losing their momentum. Within extremist circles, hatred of the Jews remains a unifying power between otherwise opposing groups, from white supremacists to Muslim and Christian fundamentalists to anti-globalization militants and far-right extremists.